India vs Australia 2019: So, was Shikhar Dhawan out or was it grasped? India vs Australia 2019: So, was Shikhar Dhawan out or was it grasped? Well, the on-field umpires went upstairs to get a clearer vision. The third umpire checked all the angles as he took his time. 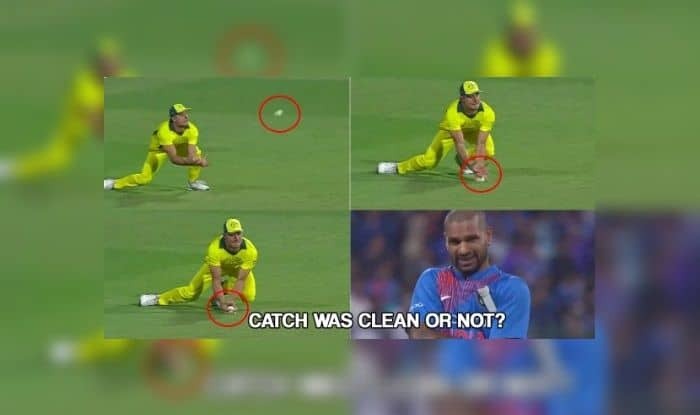 It felt because the on-field umpires had made a soft signal of out, and because there was no conclusive evidence hence the decision stood. Dhawan’s struggle came to an end as he was dismissed for a slow 24-ball 14. The southpaw looking to break the shackles advanced down the track against Jason Behrendorff but could not get the elevation he was looking for. Consequently, Stoinis ran in to take a good low catch. Can @SDhawan25 catch be really justified? “It was a pretty short series to summarise the performances. Australia outplayed us in all departments and deserved to win. 190 is a good total on most grounds but if there is so much dew as there was tonight and when you have an innings like what Glenn Maxwell played, nothing much you can do,” Kohli said at the post-match press conference. “Every team is looking to take each game like that but it’s also important to win matches. We would have liked to get across the line in at least this game but I can’t be too hard on the bowlers due to the amount of dew,” he said. Kohli also hinted that he would continue to experiment with his playing XI keeping in mind the upcoming ICC World Cup. “We wanted to give everyone some game time, we’ve seen how they react under pressure, there is a series coming up and we’ll try more things. It’s up to them to deliver the goods,” he said.